Vesping is the new travel concept: rent a Vespa and with a simple GPS Satellite Navigator you can plan your trip and visit all the spots you want! The 4 preprogrammed tours in GPS will make you discover the hidden gems of one of the most beloved cities in the world.... without getting lost on the road! 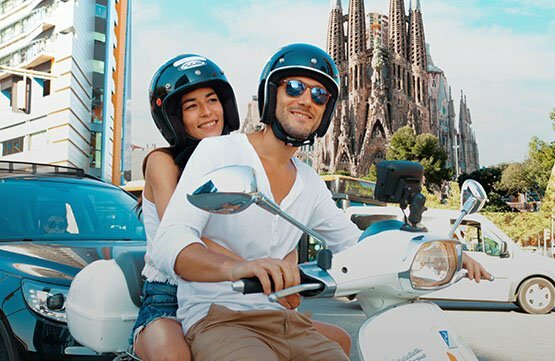 Rent a scooter with this new alternative sightseeing tour of Barcelona is the best in town and covers most important places of the city and many hidden spots usually unknown even by locals. The City Tour lasts 4 hours, it is guided by a live guide and covers almost 50 km. The Barcelona Private Tours are recommended for groups from 5 up to 50 people , who want to experience the city in their own way, starting at a certain time and also customizing their own itinerary. This solution is much more than a Barcelona scooter tour. Andrea rode us all around Barcelona, up to Tibidabo, to Mont Juic, and many more places- I never would have seen so much of Barcelona without this!!! He also had a lot of great restaurant recommendations. Tip: you DO need experience on a scooter. If you don't, ask if you can ride with a tour guide (that's what I did). Vesping exceeded our expectations and we have rented scooters in many cities. Their website is very useful and communicating via email was very helpful to answer all our questions and book the rental . When we arrived at the store, we spent half an hour with Vittorio, one of the owners helping us plan our weekend in Barcelona. He is a very nice guy and could not be more helpful and friendly. His suggestions ended up being instrumental in optimizing our time and visiting the right places. Absolutely amazing way to get around Barcelona! The staff were also amazing with lots of tips and routes around Barcelona. We went along the purple route, to the top viewpoint over Barcelona, and the views were incredible. Thanks vesping!! Excelllent way to discover Barcelona. Vittorio gave us many valuable tips to experience the city local way. Highly reccomended!!! Merci Vesping "I love Vesping"
What a wonderful experience! Thans for all the tips and untill next time 😊! Rent a scooter Barcelona is the best way to discover Barcelona, an incredible city, full of charm and with many things to see, but who wants a simple motorcycle if you can renting a comfortable and equipped Vespa to live the best experience of your life in Barcelona. With our Vespas and our tours with GPS or guided you will know first hand and as a local our wonderful city. What better than a Vespa to discover all the life that the city offers? Start now to discover Barcelona with Vesping! With our bikes you will see the most emblematic and famous places of the city so you do not miss anything, but also, specific and fascinating areas of Barcelona that do not appear in the tourist guides and even some unknown by the majority of locals. Vesping is much more than a rent scooter Barcelona agency or Vespa rental, we are travellers in love with Barcelona. We want to share with you the secrets of our city, to be sure that your stay as a traveller will be a unique and unforgettable experience. 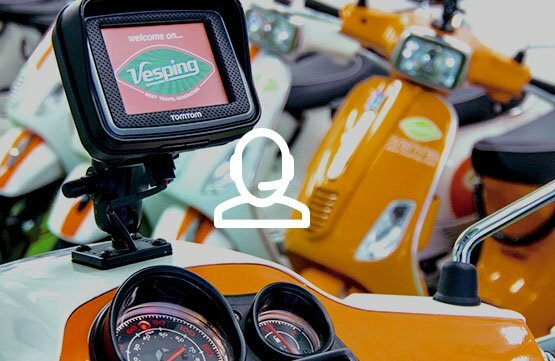 Vesping is one of the first scooter rental Barcelona company, with almost 10 years of history in the city. We are in love with the city of Barcelona and we want to share it with all the travellers who come to visit our city. Our goal is that you know Barcelona first-hand, and that's why we treat each client as if he were a friend who comes to visit us and we give him all the advice to live Barcelona like us. We prepare the tours with love and we constantly renew them with new restaurants and places so you can enjoy the real Barcelona at all times and for the best prices. We were pioneers of vespa rental service and much more than a simple rent scooter Barcelona and we have a renovated fleet with different bikes that adapt to your needs. All our reserves include a helmet, third party insurance and a lock for your security. Our offices are located in the Passatge de Simó 24, next to one of the most important monuments of Barcelona, the Sagrada Familia. From this excellent location you can start your visit to the city and go anywhere easily and quickly. 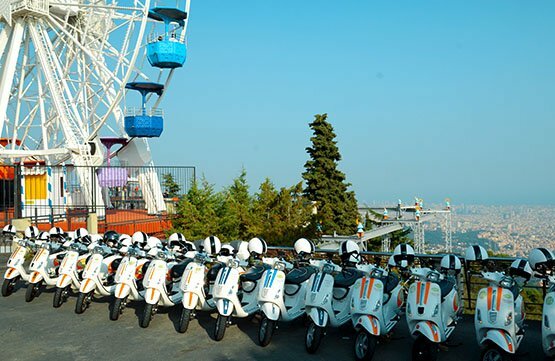 In addition, it is very well connected with public transport to collect or return your Vespa comfortably. 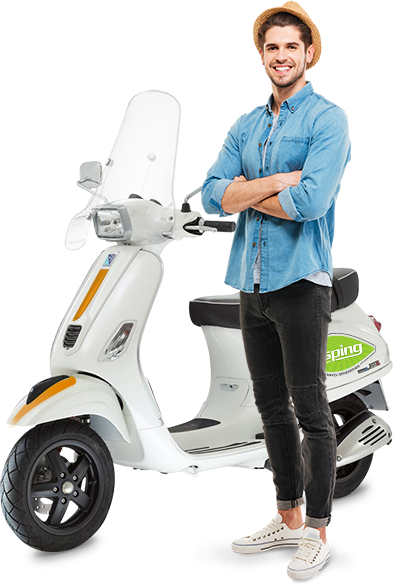 You only need to make a few clicks to rent a scooter Barcelona with Vesping. The first thing you have to do is decide the motorbike do you want to lease and the tour you need in Barcelona, but if you don't know, do not hesitate to contact us and we will help you choose the one that best suits your needs. In the reservations tab you will find all the possibilities, you just have to click on 'Book now', select the date and time and book. We will send you the confirmation of the reservation and you will be ready to pick up your Vespa in our offices. Vesping requirement for scooter rental in Barcelona are simple: you need previous experience of motorscooter driving, it is essential for your safety. Vesping can not offer rentals to people who do not have enough experience in driving two-wheeled vehicles, scooters or motobike, for safety reasons. All our Vespas are automatic (no gears). Valid driver's license and Passport or identity card to identify you correctly and process the insurance. Credit card, or cash for the deposit that will be returned when you return the Vespa and all the accessories in the same conditions. We offer a moped rental service in Barcelona that goes beyond, we want you to discover the real Barcelona, away from tourists and big crowds. Discover Barcelona by visiting the most representative bars and restaurants in Barcelona, visiting spaces and secret landscapes that hide the city, in short, discover Barcelona in an authentic way and blend in with the past, present and future of the city by using our concept of Barcelona scooter rental. About our service, you only have to look at our reviews or opinions, our main objective is the satisfaction of our clients, we want our clients to come back and prescribe our services.